The 9th Annual Short North Gala returns on Sunday, April 26, 2015, at 6:00 p.m. at the Hilton Columbus Downtown. 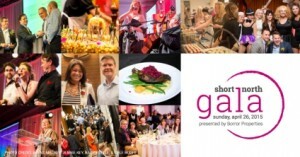 The Gala is a highly experiential affair that immerses guests in the flavors and spirit of the Short North Arts District. The evening begins with cocktails, hors’ dourves and entertainment just outside the Hilton Ballroom. Following cocktails, the celebration transitions to the Hilton’s ballroom, where the evening shifts to a higher gear as acclaimed Short North chefs take center stage to create a one-night-only culinary masterpiece. 2015 Unsung Heroes – Recognizing individuals who enrich the Quality of Life in the Short North and Columbus through their volunteer efforts and contributions behind the scenes to advance Art, Community, Diversity and the Short North Spirit. 2015 Business Beacon Award – Recognizing those who have served as catalysts to bring a broad range of visitors to the District and have inspired others to invest in and nurture the Short North Arts District. 2015 Architectural Star – Recognizing those who have significantly advanced the Short North landscape through architectural design related to property development, renovation, or improvement. 2015 District Partner Award – Recognizing those who have deep collaborations with the Short North Arts District resulting in significant advancement of the District success in commerce and quality of life. Order individual tickets online through EventBrite.com. To reserve a standard table or “Friends of the Short North” table, please contact the Short North Alliance office at 614.299.8050 or Info@ShortNorth.org. Tables seat 10 guests. Harrison West Society Election Season – Now in Bloom!